Aries are people of action, by their nature fearless, able to overcome any obstacles. Representatives of the fire sign have a violent temperament, the manifestation of which is individual in each case. An important role in the fate of a person is played not only by day and month, but also by the year of birth. Eastern sages believed that each year passes under the sign of a certain animal that affects the lives of people born in this period. Therefore, the combination of Aries with the signs of the Chinese Zodiac gives a more accurate picture of the character of a person, fully reveals his inner potential. Distinctive features of Aries character: purposefulness, determination. He does not think his life without a favorite affair, enjoys the respect of his colleagues who are ready to put up with his inherent obstinacy. A typical representative of the sign, fully responding to this characteristic, is the Aries-Bull. It makes all decisions independently, always insists on its own opinion. He works hard and works hard, he is not equal with solving difficult working moments, but when he reaches his goal, he loses interest in his offspring. Frequent change of a place of work is one more sign of his increased activity, propensity to impulsive actions. 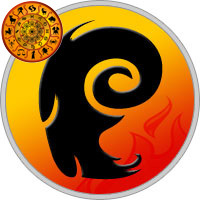 Aries is a fire sign, giving its representative an explosive temperament. Inflexibility, stubbornness often leads to quarrels and conflicts. Aries is intolerant of the weaknesses of other people, does not consider it necessary to hide their thoughts and feelings, to suppress negative emotions. But at the same time he is a resourceful person who is not able to remember for a long time resentment. He is distinguished by generosity, generosity, generosity. An indicative example in this respect is the Aries-Dog: a tactful person tries not to hurt the feelings of surrounding people, shows cordiality, endless patience towards them. In love, Aries does not change his nature, an energetic and active person strives to completely take possession of the heart of the second half. The representative of the fire sign expresses his feelings roughly and sincerely, the strength of his temperament is such that it is difficult to restrain emotions, reduce the intensity of passions. But the influence of the dominant element depends to a large extent on the year of birth. For example, Aries-Rat — a romantic nature, believes in love at first sight. He prefers to act subtly, in the attitude of care. Congenital intuition helps her bypass difficult moments, usually happy in family life. In total, there are 12 possible combinations for the Aries sign, we suggest that you familiarize yourself with each option in more detail.